Tour Educators: Muki Jankelowitz & Shari RobinsThis trip is open to all ages and all faiths. The cost of the trip is $2,850 per person*. Trip extensions and room upgrades are available. Please note online payment is for Double Occupancy and 4-Star Accommodations only. If you are travelling at the Single Occupancy rate or with 5-Star Accommodations, please contact Carol at 520-647-6446. Deposit of $500 due upon registration for the land portion only of $2,850 per person based on double occupancy in 4-star hotels. An upgrade is available for an additional fee. The remainder of the balance is due by May 1, 2018, but we have extended it to July 1st. However, please note the cancellation policy remains the same. You may make a single payment pay over 2-months. Cancel May 1 – September 1, 2018: cancellation fee – 50%. Cancel after September 1, 2018, cancellation fee – 100%. No refunds will be available after September 1, 2018. *Cost for the round-trip is approximately $1,160 per person from LAX to Tel Aviv. Each person must book their own flight from Tucson to LAX at their own expense. All land arrangements in Israel are finalized with JCCA Israel Center who is our land provider. Information about Upgrades, room inclusions, and exclusions, click here. Meals and activities which are included as part of the trip are indicated in the program. Other meals and activities indicated by an asterisk (*) are the responsibility of the participants. 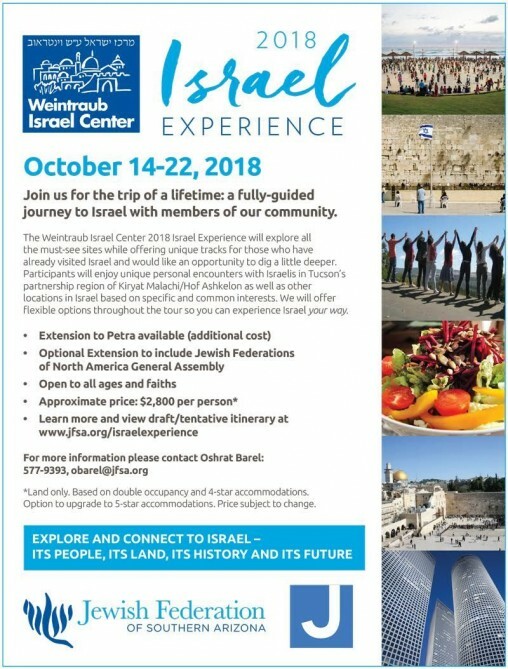 We are thrilled to invite you to explore our new offer, the Weintraub Israel Center’s Israel Experience. A fully-guided journey to Israel. All the “must see” sites together with unique tracks for those who have already visited Israel and would like an opportunity to dig a little deeper. Unique personal encounters both in Tucson’s Partnership region of Kiryat Malachi and Hof Ashkelon as well as other locations in Israel based on specific and common interests of the group. Flexible options throughout the tour. Open to all ages and faiths. 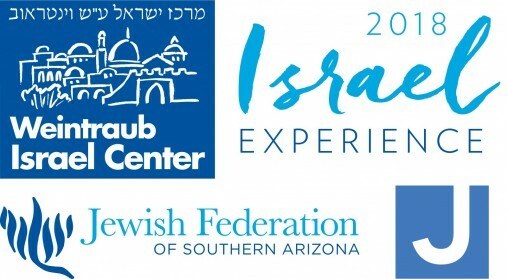 The Weintraub Israel Center is proud that this new initiative will fulfill our mission statement - to build a living bridge between Tucson and Israel. Please note. The program is subject to change. Welcome to Israel! After safely landing at Ben Gurion International Airport we will travel to the coastal city of Tel Aviv. Meet at Ben Gurion airport with tour educators, and staff from the JCC Israel Center. Drive to the Old City of Jaffa that begins with an overview from Jaffa, a gate way to the Holy Land for thousands of years and a view of modern Tel Aviv. Make a Shechyanu (blessing of gratitude) there. Depart for opening dinner and orientation to the trip at local Tel Aviv restaurant. Overnight – Royal Beach Hotel, Tel Aviv. Our journey begins exploring the first modern “Hebrew City”, and its expression of modern Jewish-Zionist identity. 8:30 am Making Sense of Israel” an intriguing introduction to Israel to set the stage for this journey with educator Avraham Infeld (at hotel). 10:00 am Track 1: “The Beginnings of the Modern Hebrew City of Tel Aviv," depart for a guided tour; walk through Neve Tzedek, one of the first neighborhoods of the modern city of Tel Aviv and hear the stories of the founders of Tel Aviv and their vision for the cultural capital of the State of Israel. Included is a guided visit to Independence Hall, where the State of Israel was proclaimed in 1948 and a look at the guiding principles of the founders of the State. Track 2: “Tel Aviv as the trail blazer of the start-up nation”- visit a local start up and learn why the culture of the city provides fertile ground for innovation. Track 3: Visit one of Tel Aviv’s Art museums and focus on one of the city’s great artists (Nahum Guttman, Reuven Rubin) or tour the Israeli art wing at Tel Aviv Modern Museum of Art (staff decides in planning process which museum to visit). Track 4: "Tel Aviv on Two Wheels," depart on bicycle through some of the different areas of Tel Aviv to get a sense of the city's expanse and diversity. 12:30 pm *Tracks meet up for lunch on own Nachlat Binyamin artisans market and time to stroll through stalls and the adjacent Carmel market. 2:00 pm Depart for the excavations at Caesarea city on the Mediterranean Sea expanded by Herod the Great who renamed it Caesarea Marittima, in honor of the Julius Caesar. It was an exemplary Roman city, with all the Roman cultural and engineering ingenuity. 5:30 pm Travel north; check into the hotel. 7:30 pm Dinner at the hotel followed by a wrap-up discussion of the day's events. A day to focus on staff development, and getting a closer look at some of the areas of Israel. 8:30 am Depart for a guided visit to the Mount of Beatitudes Church on the northern shores of the Sea of Galilee. Ascend Golan Heights and visit Mount Ben Tal, for overview of the borders of Israel and look into Syria, with an opportunity to discuss the geo-political status of the region and the humanitarian efforts made by Israel to care for wounded from Syria.Golan Heights and visit Mount Ben Tal, for overview of the borders of Israel and look into Syria, with an opportunity to discuss the geo-political status of the region and the humanitarian efforts made by Israel to care for wounded from Syria. 12:30 pm Lunch and wine tasting at one of the Golan boutique wineries (each bus will visit a different winery).Golan boutique wineries (each bus will visit a different winery). Track 1: Depart for jeep ride off the beaten track to explore some of the important historic and military sites in the upper Galilee. Track 2: Visit one of the pre army leadership training programs "Mechina" to meet with the young people and discuss with them what motivates them to devote a year to volunteering and studying prior to their army service.Mechina" to meet with the young people and discuss with them what motivates them to devote a year to volunteering and studying prior to their army service. Track 3: Hike in one of the nature reserves in the Golan Heights or visit to the Agmon Hahula nature reserve and take a golf cart or bicycle around the reserve which is a landing and feeding place for millions of birds who migrate every winter across the continent.Golan Heights or visit to the Agmon Hahula nature reserve and take a golf cart or bicycle around the reserve which is a landing and feeding place for millions of birds who migrate every winter across the continent. 5:30 pm Tracks meet up at the Baba Yona ranch – take part in the culinary delight and cooking contest – preparing your own meal and learning about some traditional Israeli foods – salads and "al ha'esh" (BBQ).Yona ranch – take part in the culinary delight and cooking contest – preparing your own meal and learning about some traditional Israeli foods – salads and "al ha'esh" (BBQ). The day begins with a visit to Beit She'an to meet with some of the residents and hear their stories and how they reflect the mosaic of Israeli society; travelling up to Jerusalem to explore the city’s place as central to three religions; visit the Jewish and Christian Quarters of the Old City and excavations adjacent to the Temple Mount; visit remnants of Jewish life from Temple times and also get a taste of contemporary Jerusalem and some of the social challenges facing residents of the capital.Beit She'an to meet with some of the residents and hear their stories and how they reflect the mosaic of Israeli society; travelling up to Jerusalem to explore the city’s place as central to three religions; visit the Jewish and Christian Quarters of the Old City and excavations adjacent to the Temple Mount; visit remnants of Jewish life from Temple times and also get a taste of contemporary Jerusalem and some of the social challenges facing residents of the capital. 8:30 am Check out of hotel and drive to Jerusalem. 9:30 am "Sirim ve Sipurim," (Saucepans and Stories) meet with local personalities from Beit Shean and hear their stories of how they and their families arrived in Beit Shean, challenges and aspirations for the future.Sirim ve Sipurim," (Saucepans and Stories) meet with local personalities from Beit Shean and hear their stories of how they and their families arrived in Beit Shean, challenges and aspirations for the future. 11:00 am Depart for Jerusalem. Lunch at Eucalyptus restaurant overlooking the walls of the Old City. 3:00 pm "Centrality of Jerusalem for the Major Religions," depart for a short guided visit through selected areas of Jerusalem's Old City, and a guided walk of Jerusalem of the Second Temple Period in the Jewish Quarter including a visit to the southern wall excavations and the Kotel (Western Wall).Kotel (Western Wall). 5:00 pm Check into hotel. 7:00 pm *Track 1: Depart for Machane Yehuda shuk which transforms at night from a fruit and vegetable market to a place of music, bars and restaurants; dinner on your own.Machane Yehuda shuk which transforms at night from a fruit and vegetable market to a place of music, bars and restaurants; dinner on your own. *Track 2: Depart for Mamilla Mall or the First Train Station for dinner your on own.Mamilla Mall or the First Train Station for dinner your on own. Overnight – David Citadel and Dan Panorama (or Inbal hotel and Dan Panorama/Mt Zion).Inbal hotel and Dan Panorama/Mt Zion). Journey to the wilderness to understand the many dimensions of Masada as history and myth, and the significance of the Dead Sea area in Jewish history and Israel today.Masada as history and myth, and the significance of the Dead Sea area in Jewish history and Israel today. 8:00 am Depart for Masada.Masada. Drive along the shores of the Dead Sea and look at the changing structure of the Sea which is shrinking from mineral mining and evaporation. 10:00 am Ascend Masada by cable car for a guided visit to the extensive excavations of Herod's fortress above the Dead Sea, including discussion about Masada as a strategy for Jewish survival.Masada by cable car for a guided visit to the extensive excavations of Herod's fortress above the Dead Sea, including discussion about Masada as a strategy for Jewish survival. (possible parallel track for veteran visitors to see lesser known sites in the Dead Sea such as Qumran caves, hike in Nachal David etc).Qumran caves, hike in Nachal David etc). Enjoy a quick swim in the Dead Sea at one of the beaches in the Northern Dead Sea. 2:30 pm Depart for Jerusalem. 5:00 pm Meet as a group for Shabbat candle lighting; depart for the Kotel (Western Wall) for Kabbalat Shabbat (welcoming the Sabbath).Kabbalat Shabbat (welcoming the Sabbath). 7:30 pm Shabbat Dinner at the hotel hosting a few soldiers from the Michael Levin Lone Soldiers Center. Experiencing the beauty of Shabbat as a different dimension of a Jewish journey – the weekly separation from daily life and an opportunity to explore its meaning for different people in Israel and abroad. Free time to join Shabbat Services in one of Jerusalem's many synagogues or to enjoy Jerusalem's parks, visit the Old City or just relax. 11:00 am Track 1: Walk through Yemin Moshe Neighborhood with the poetry of Yehuda Amichai.Yemin Moshe Neighborhood with the poetry of Yehuda Amichai. Track 2: Visit selected exhibitions at the Israel Museum, considered to be one of the most significant encyclopedic museums housing extensive art and archeology. Track 3: R&R at the hotel or meet up with friends and family. 1:00 pm *Shabbat lunch on own (Shabbat lunch is available at the hotel by reservation for additional fee). 2:30 pm Depart from hotel for a guided tour of Old City in Christian Quarter and visit Church of the Holy Sepulcher and the rooftops of the Old City. 5:30 pm Wrap-up discussion followed by Havdallah. 7:00 pm Depart for dinner at Jerusalem restaurant on Mamilla Mall.Mamilla Mall. Sound and Light Spectacular at the History of Jerusalem Museum at Jaffa Gate (optional with reservation). Overnight – David Citadel and Dan Panorama (or Inbal hotel and Dan Panorama/Mt Zion). Today we devote time to getting a greater understanding of the Holocaust and its impact on Israeli society followed by a visit to our partnership region of Kiryat Malachi and Hof Ashkelon for a closer look at the notion of peoplehood and strengthening relations between our communities. 8:00 am "Understanding the Significance of the Holocaust in Israeli Society," with educator Rachel Korazim (at hotel). 9:15 am Depart for visit to the historical museum of the Holocaust at Yad Vashem, including the Avenue of the Righteous of the Nations and a visit to the Children's Memorial. 2:30 pm Depart for Kiryat Malachi and Hof Ashkelon. Visits to communal projects in the region. Home hospitality or dinner with local residents. Hike and/or visits to other sites to get acquainted with the region. 9:30 pm Depart for Jerusalem. Coming full circle, an opportunity to enjoy different experiences that make up contemporary Israeli society: politics and security; tikkun olam and culinary trends as a reflection of Israel's diverse cultures. Farewell to participants attending the GA who will check out of hotel and have transport to the GA.
9:00 am All the group departs for Beit Guvrin National Park, located in Israel’s lowland hills and participate in an archaeological dig and cave crawling to get a sense of the layers of history buried there. Track 2: Tikun Olam – volunteer opportunity at Pantry packers packing dry goods for the needy followed by a stop for coffee at Harutzim, a social enterprise café which is run by adults with disabilities. Track 3: Flavors of Israel – guided visit to Machane Yehuda fruit and vegetable market and some of the lesser known alley ways to meet with some of the store holders and tastings to get a sense of the culinary mosaic of Israel. * Lunch on your own followed by free time (in Jerusalem or Tel Aviv). 4:00 pm Check out of the hotel followed by wrap up discussion with tour educator and JCC Israel Center staff. 6:00 pm Depart for final dinner at Jerusalem restaurant. Depart for airport or vacation extension. Petra is an archaeological site in Jordan, lying in a basin among the mountains which form the eastern flank of Wadi Araba, the great valley running from the Dead Sea to the Gulf of Aqaba. It is famous for having many stone structures carved into the rock. The long-hidden site was revealed to the Western world in 1812. Its famous description "a rose-red city half as old as time" and the capital of the Nabataeans.